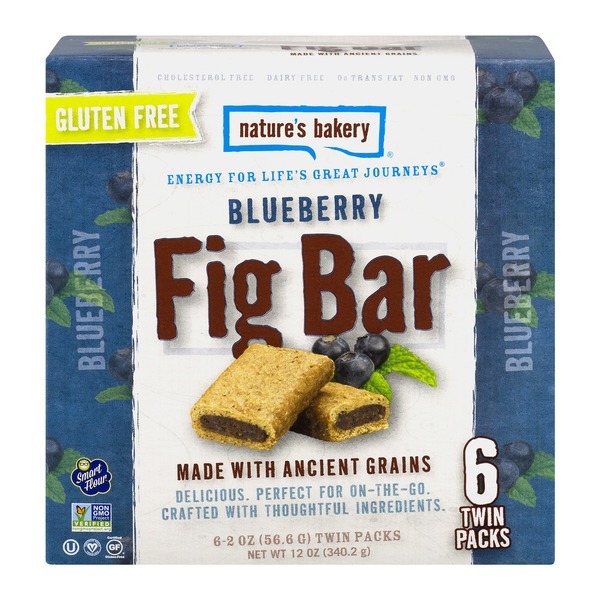 Nature's Bakery® Fig Bar Gluten Free Blueberry. Energy For Life’s Great journeys®. Made With Ancient Grains. Delicious. Perfect For On-The-Go. Crafted With Thoughtful Ingredients. Smart Flour. Cholesterol Free. Diary Free. 0% Trans Fat. 6-2 OZ (56.6 G) Twin Packs. Net Wt 12 OZ (340.2 g). Ingredients: Smart Flour (Tapioca Flour, Teff Flour, Sorghum Flour, Amaranth Flour), Fig Paste, Dried Cane Syrup, Brown Rice Syrup, Canola Oil, Rolled Oats, Date Paste, Blueberries, 100% Blueberry Juice Concentrate, Flax Seed, Natural Flavor, Citrus Flour (Citrus Fiber, Guar Gum), Sea Salt, Oat Fiber, Citric Acid, Baking Soda.